Last December, a friend was looking for some bff necklaces for herself and her two besties. These are not some junior high gals I’m talking about — these three women are in their 30s, and they all have children. But they’ve practically known each other since they were fetuses (feti? ), and she knew the other two would get a kick out of such a whimsical gift. What a fun idea for a bridesmaid gift! She searched on Etsy for some rock/paper/scissors necklaces and came up empty-handed. I could make them, I offered, and I continued to scour Etsy for some affordable and adorable rock, paper and scissors charms. To add to the cute factor, the “paper” I found was in the shape of a paper airplane. I toyed with using a little boom box or guitar for the “rock” but settled upon a stone bead that was very rock-looking. 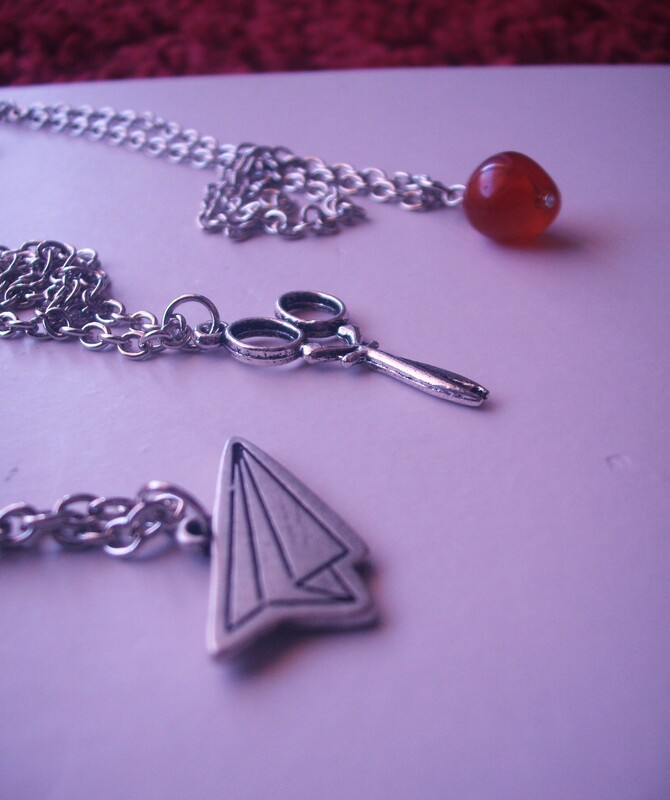 The friend, and her friends, loved the necklaces — I love seeing her with her little paper airplane at work — and I promptly relisted the necklaces on Etsy. They sold within a week, my first international sale, to a woman in England. I just yesterday got around to relisting the set, and I had a bride contact me today with the cutest custom order: rock/paper/scissors bridesmaids gifts. I’m customizing them with a Czech bead to match her bridal colors — it’ll be an orange bead — free of charge. Frankly, I love the idea of getting your bridesmaids something so honkin’ adorable, and I’m happy to make them match even more so.